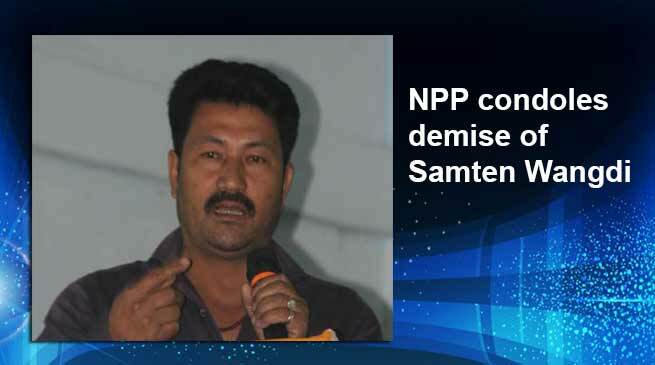 National People’s Party (NPP) Arunachal Pradesh expressed its deep sense of condolence on the sudden demise of veteran Political figure and social worker of Tuting area Samten Wangdi . Gicho Kabak State President and Nima Sangey Saling Vice-President & Spokesperson of National People’s Party (NPP) Arunachal Pradesh alongwith State office bearer expressed its deep sense of condolence on the sudden demise of veteran Political figure and social worker of Tuting area Samten Wangdi who passed away on 12th April 2019 at Tuting. He was attack by pressure stroke while he was performing his duty as Polling Agent for BJP MLA Candidate Alo Libang Minister at his native Village Kope, Under Tuting Sub-Division of Upper Siang District on 11th April 2019. He was immediately admitted to CHC Tuting, but could not save his life due to the lack of medical facilities at Tuting CHC. Late Samten Wangdi, age 52 years was the husband of Smti Tsomo Ex. ASM of Kopu-Beshing-Bona and popularly known him as Tender Lama or Kopu Tender was the District President of BJP Minority Morcha, Upper Siang District and served various capacity in the field of social and political activities in the district and rendered his valuable service to the people of Upper Siang District during his long associated with different political and social activities in the district. I have been associated with Samten Wangdi from his childhood and seen him from close range and found him worthy of admiration and he was the man of practical, simple and down-to-earth who can adjust to any situation, and who mingles freely with people, earning respect and admiration from friend and foe alike. He was truly a man of masses. He reads and understands the minds of the masses, and therefore communicates well with them in all the time. is untimely demise is a great loss for the Tuting Sub-Division. His departure has created a vacuum in his family as well as in the society and the State. We the people of the state have lost a renowned social worker, perfect gentlemen, visionary community leader who dedicated his life for the welfare of people of the Tuting Sub-Division under Upper Siang District of Arunachal Pradesh. He will be always remembered by the people of the Arunachal Pradesh for his humble nature and honesty. Nima Sangey Saling Vice-President & Spokesperson State NPP, Shri Pema Nyisur District President NPP Upper Siang District alongwith public leaders of Tuting-Sub-Division attended the funeral programme at his native Village Kopu. The state National People’s Party (NPP) prayed to Almighty God for his eternal peace of departed soul and bestows strength to the bereaved family members to bear the irreparable loss cause to them.